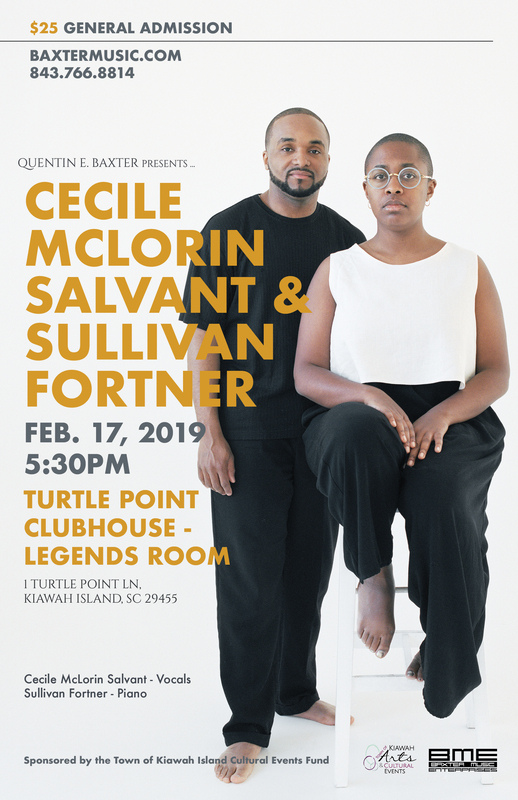 The second concert in Quentin Baxter’s Turtle Point series features 2019 GRAMMY® Award nominee Cécile McLorin Salvant with pianist Sullivan Fortner. McLorin Salvant’s newest release, The Window (2018), an album of duets with Fortner, explores and extends the tradition of the piano-vocal duo and its expressive possibilities. With just Fortner’s deft accompaniment to support McLorin Salvant, the two are free to improvise and rhapsodize, to play freely with time, harmony, melody and phrasing. The world first learned of the incredible vocal artistry of McLorin Salvant when she won the prestigious 2010 Thelonious Monk International Jazz Competition. In just under the span of a decade she has evolved from a darling of jazz critics and fans, to a multi-GRAMMY® Award winner, to a prescient and fearless voice in music today. Fortner, lauded as one of the top jazz pianists of his generation, is recognized for his virtuosic technique and captivating performances. The winner of three prestigious awards – a Leonore Annenberg Arts Fellowship, the 2015 Cole Porter Fellowship from the American Pianists Association, and the 2016 Lincoln Center Award for Emerging Artists – Sullivan’s music embodies the essence of the blues and jazz as he connects music of all eras and genres through his improvisation.